Normally, the setup of Exchange 2010 Rollup 1 is a no-brainer. However, not all Exchange systems have access to the internet. As with Exchange 2007 Rollups, Exchange 2010 Rollup 1 contains managed code of which the assemblies need to be compiled during setup. This requires an internet connection to verify the certificates. 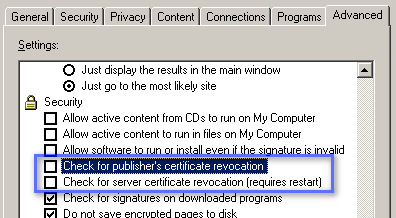 If you have no internet connection the setup is very slow because it needs to wait for certificate revocation checks to timeout. You can re-enable the checks afterwards when required. This entry was posted in Exchange 2010 by Michel de Rooij. Bookmark the permalink. Sorry, just using WordPress themes and they are (or at least should be) mobile-friendly. Hello Michel, thanks for your work. Unfortunately I see this post after applying the update, still in progress, do you know approximately how much time does it takes to complete (or the timeout duration?) ?